Jamia Millia Islamia (JMI) has instituted scholarship for fifty students coming from economically disadvantaged sections of the society in the name of Dr. A.P.J. Abdul Kalam, former President of India. This figure is likely to increase in the next academic session. 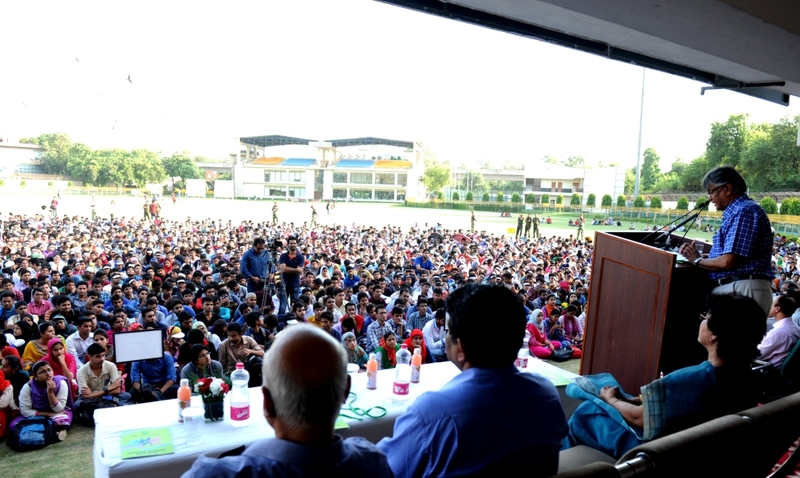 Addressing an Orientation Programme in Jamia Millia Islamia, organized for newly admitted students in the academic session 2015-16, Prof. Talat Ahmad, Vice-Chancellor, JMI made this announcement indicating his resolve to provide top-quality education backed up with enabling learning-resources and infrastructure. Prof. Ahmad, JMI pitched Jamia as an institution that would assume leadership in knowledge-based economy. Addressing over 4000 students, who had assembled in the sports stadium along with their teachers, Prof. Ahmad said that quality research was an important benchmark for an institution of higher learning as it enabled us to broaden our knowledge and also kept us abreast of latest developments. Prof. Ahmad drew attention to the good practices that the university had come to institutionalize since its inception and hoped that students would uphold those values and conventions by bringing laurels to the university as its ambassadors. He encouraged students to uphold the cultural roots of the nation even as they explore opportunities to infuse new ideas and practices. He talked about the opportunities offered in Jamia such as Jamia Global Alumni Network, Talimi Mela, Distinguished Lecture Series, andInspirational Talks that could benefit students directly and contribute to their growth. He requested them to get involved in all such activities. He also reminded them of their primary duties that were to excel in their studies, among other things, so that they could have promising career and could contribute to nation building. Earlier, Prof. Tasneem Meenai, Dean Students’ Welfare, Jamia Millia Islamia (JMI) and her team welcomed the students and introduced the university officials and talked about the infrastructural facilities for the use of students and gave them an overview of how various student- linked departments and administrative divisions functioned. Senior university officials and teachers also participated in the event.